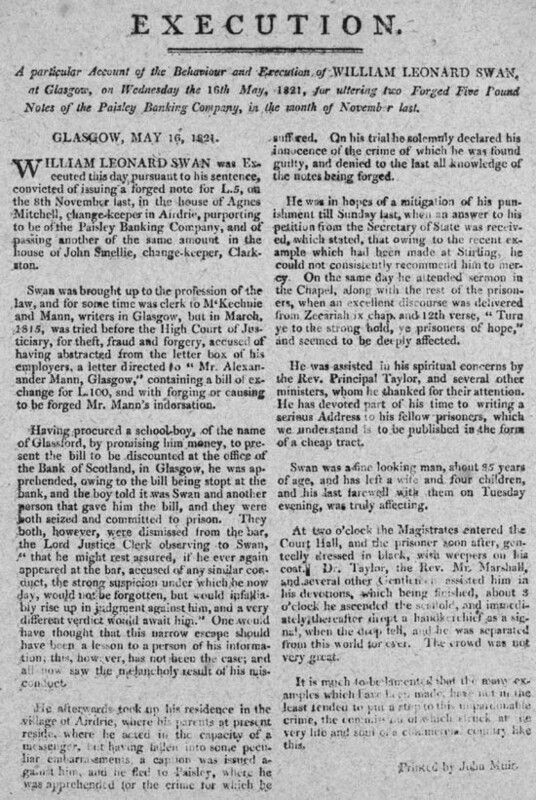 This account of an execution begins: 'a particular Account of the Behaviour and Execution of WILLIAM LEONARD SWAN, at Glasgow, on Wednesday the 16th May, 1821, for ultering two Forged Five Pound Notes of the Paisley Banking Company, in the month of November last.' It was published by John Muir of Glasgow and is dated 16th May 1821. The sentence of death for forgery appears very harsh, but the judge's decision was probably swayed by Swan's earlier trial for a similar crime where, despite being acquitted, he was warned that the suspicion against him would not be forgotten. The report records that Swan's appeal to the Secretary of State failed because a recent forgery case in Stirling had also resulted in the death penalty. This is a reference to the case of John Fleming, who was executed at Stirling five days before Swan for issuing a forged £5 note.